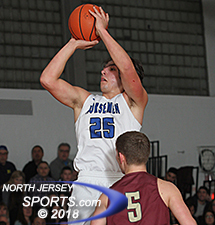 Senior Joe Rotonde hit a 3-pointer with :02 left in the third overtime to force a fourth where Demarest finally got past Wayne Hills, 52-50, in the North 1, Group 3 state sectional semifinals on Friday night. DEMAREST – There were five seconds left in the third overtime of Friday night’s North 1, Group 3 state semifinal and Northern Valley/Demarest’s Joe Rotonde had the ball deep in the corner. His team was trailing by three points and Rotonde’s options were dwindling as fast as the game clock. Demarest needed a three-pointer, there was no other open shooter to kick the ball to and there was a Wayne Hills defender fully closed out in the corner where Rotonde had the ball. He had to shoot it anyway and, unlike so many stories of fantastic finishes, his attempt did not end well as Justin Wills rose up and blocked Rotonde’s shot at tying the game. Now here is where the folklore part of the story starts: Yes, his original attempt was blocked and had it gone out of bounds, Demarest would have been forced to inbound the ball from deep in the corner with about two seconds to go and with only a prayer of hitting what probably would have been an off balance jumper taken by a covered and hurried shooter. Instead, the blocked shot landed right back in Rotonde’s hands and, with all of the commotion, he found himself in the same spot with the same shot, but this time basically uncontested. 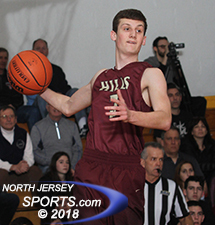 Joey Belli, who helped lead Wayne HIlls to its first ever Passaic County championship two weeks ago, finished his stellar high school career with a team-high 18 points. Rotonde’s shot did not win the game, but it did extend it to a fourth overtime and the outcome was decided in a more conventional fashion. Endrit Kalici, another Demarest senior, calmly hit both ends of a one-and-one with 31 seconds left for the only points of the fourth extra session. When Wayne Hills’ last desperation three-pointer fell short, third-seeded Demarest had a 52-50 win and a spot in the North 1, Group 3 state sectional final where it visit No. 1 Ramapo, a 55-38 winner over Northern Highlands in Friday night’s other semifinal. Demarest has not won a section title since 2005 and it was Kaleci’s two free throws that pushed them into position to end the 13-year drought on Tuesday in a 7 p.m. start in Franklin Lakes. Demarest had its way early on as it picked apart the Wayne Hills zone on the way to a 9-0 start and a 13-3 lead. With Jake Runyon working the foul line, with Zack Stimmel (game-high 20 points) knocking down three first half three-pointers and with the Norseman winning the battle of the boards in front of a packed home and raucous student section, the home team led 16-9 after the first quarter. Runyon hit a leaner three minutes into the second quarter to make it 22-13 and Stimmel’s trey with 4:19 left in the first half gave Demarest its largest lead of the game at 25-15. Senior Jake Runyon scored 14 points for Demarest, which will play Ramapo for the section title on Tuesday night. Shortly after that, Wayne Hills came out of its zone and started to make up ground. Jason Modak (8 points) scored inside and Patrick Gilmore made a three from the corner to draw the seventh-seeded Patriots to within 29-24 by halftime. The first half flew by as there were a combined three personal fouls called and just three total free throws shot in the opening 16 minutes. 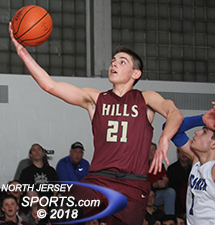 There was only one free throw taken in the third quarter and that was at the end of Joey Belli three-point play that kicked off a 21-4 run that took Wayne Hills from down 32-24 to up 45-36 when Wills (11 points) and Belli opened the fourth quarter scoring with back-to-back three-pointers. Stimmel steadied the Norsemen with two triples in the span of 1:17 and Rotonde (12 points) made one with 2:28 left in regulation to get Demarest back to with 47-45 and Runyon (14 points) scored in the post to tie the game with 1:44 left. That marked the start of a recurring theme in which each team held the ball, or at least tried to, on every possession the rest of the way. A Wayne Hills turnover gave Demarest the last shot of regulation, but that was missed and it was off to overtime No. 1 all square at 47. With Runyon winning all four jump balls to start the overtime periods, Demarest had the first possession each time. With no shot clock to interrupt the dribbling around the perimeter, Wayne Hills got only one possession in the first overtime while Demarest had two and none of them ended in points. Each team only had one possession each in the second overtime with the same result, no scoring and the first 2:08 of the third overtime passed without either net moving at all. Through 10:08 covering two-and-a-half extra sessions, the cumulative score was 0-0. Justin Wills finished with 11 points for Wayne Hills. 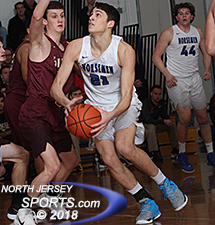 Finally, which 1:52 to go in the third OT, Belli (team-high 18 points) went to the basket, was fouled and finished off the three-point play to give Wayne Hills a 50-47 lead, but Demarest head coach Joe Dionisio elected not to change course. Even down three, he chose to bleed the clock for the last shot or shots, which turned out to be Rotonde’s blocked and then made three-pointer inside the final five seconds that forced the game into the fourth OT. Demarest went in for a lay-up right off the tap in the fourth overtime but missed and Wayne Hills tried an early three that also was off the mark before the pace slowed again. Demarest’s second possession included time outs taken with 1:21 and :50 left and ended with Kalici’s two made shots from the foul line on the first bonus free throws taken by either team. Kalici made them both and Wayne Hills turned the ball over with a chance to tie. Demarest missed the front end of a one-and-one with eight seconds left which gave the Patriots one last shot to tie or win, but it came up short and Demarest is moving on.